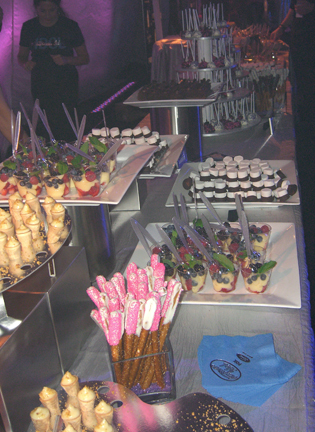 I went to the American Idol season 10 finale and the afterparty! I went to an American Idol finale and afterparty! 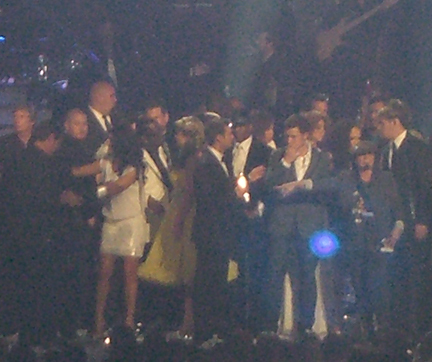 On May 25th, 2011, I had a ticket to the hottest show in town, if not the world: the American Idol season 10 finale. I made my way through the throngs of people surrounding the Nokia Theater in Downtown Los Angeles to join approximately 7,000 people in watching the show, live! I entered the theatre about 45 minutes before showtime and caught my first glimpse of the American Idol set. On stage, a group of dancers did a final rehearsal. Ushers directed guests to their seats. Some audience members carried handmade signs; one young girl had attached lighted dots to her sign and lined the edges with a feather boa. The auditorium was only about three-quarters full when I entered, but that changed quickly. Soon I couldn't spot any empty seats. At about fifteen minutes before showtime, the audience warm-up guy, Cory Almedia, introduced himself to the audience and invited a few brave audience members onto the stage to show off their dancing skills. Then, it was time to introduce the judges. One by one, Corey introduced Randy Jackson, Jennifer Lopez, and Steven Tyler to the enthusiastic applause and cheers of the audience. The judges entered the stage from the wings and walked to their familiar chairs while waving at the audience. Once they had all been introduced, hair and makeup people swarmed them. "2:30," a female voice informed us over the sound system. This voice would become very familiar to us during the show. During each commercial break, The Voice periodically noted the amount of time remaining until we would be live on the air. Corey explained to the audience how the opening of the show would work. It would be a "cold opening" with host Ryan Seacrest "in the house." We were told to stay quiet until Ryan said, "American Idol," then we could cheer and applaud. And then, it was showtime! A spotlight illuminated the section of the orchestra where Ryan was standing. Ryan delivered his opening, "...American Idol!" The audience erupted in cheers. 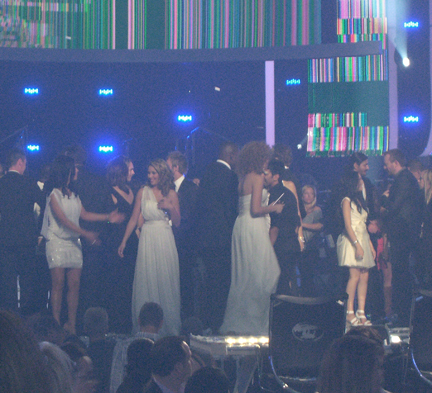 What followed was a parade of the talented Top 13 Idol finalists (Scotty McCreery, Lauren Alaina, Haley Reinhart, James Durbin, Casey Abrams, Jacob Lusk, Stefano Langone, Paul McDonald, Pia Toscano, Thia Megia, Naima Adepo, Karen Rodriguez, and Ashthon Jones) as well as Judas Priest, Kirk Franklin, Gladys Knight, Jack Black, Tony Bennett, TLC, 'Lil Jon, Tim McGraw, Marc Anthony, Jennifer Lopez, Sheila E., Tom Jones, Lady Gaga, Carrie Underwood, Beyonce, Reeve Carney, Bono, The Edge, and Steven Tyler, all performing live. Between performances, during the commercial breaks, Corey made his way around the auditorium handing out American Idol t-shirts and interviewing adorable young fans; one was just four years old. 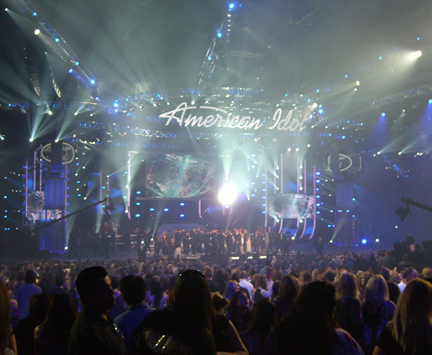 Meanwhile, the American Idol crew, dressed in black, transformed the stage. Their most impressive transformation was the construction and deconstruction of a faux rocky peak that Lady Gaga danced on while singing, "Edge of Glory." The set piece was like a giant 3-D jigsaw puzzle, with a big, inflatable airbag that Lady Gaga and her dance partner, Mark Kanemura, landed on when they leapt from the top. Because we could see more than just what the television audience sees at home, we caught some fun behind-the-scenes moments. 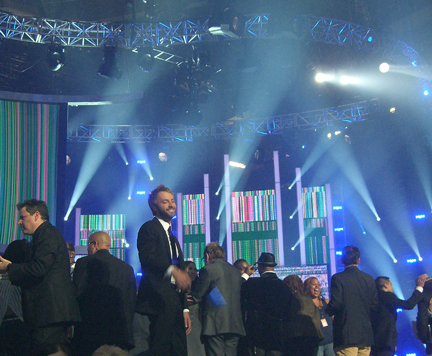 I spotted one of the guest performers, a few moments before his entrance, step out onto an unlit, off-camera area of the stage and take in the crowd as he moved his microphone in time to the music. I was moved by Tim McGraw who tenderly laid his hand on Scotty's shoulder, like a father would do to his son, as they walked off stage. The two hours flew by. American Idol was already into the ten o'clock time slot (as planned I'm sure) when the Idol finalists took their positions and Lauren and Scotty were led center stage. Lauren leaned down to fix her shoes as The Voice counted down, "three, two..."
Ryan was handed an envelope. The tension was palpable. "Lauren!" pleaded a woman a few rows behind me. "Scotty!" a man in the row in front of me bellowed. "And the winner is... Scotty!" The crowd cheered. It was hard not to be touched as Scotty sang, "I Love You This Big," while he hugged his family and friends. We watched the end of the song through a curtain of blue, white and silver confetti and streamers. And then, the show was over. I made my way toward the stage through at least an inch of confetti. 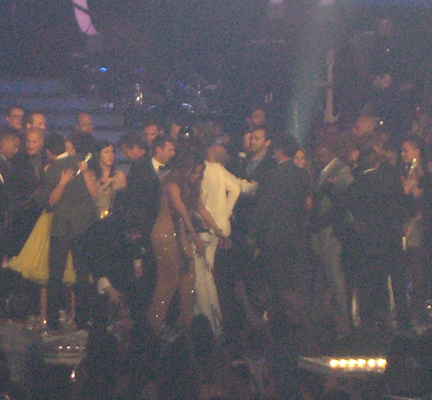 On the stage, the Idols, judges, and families hugged and talked. The images on the huge screens above the stage changed to test-patterns and then went black. The theater emptied quickly. The Idols were whisked from the stage. I made my way to my next stop: the afterparty. On my way to the party, I entered a backstage area where movie trailers were set up for the judges. 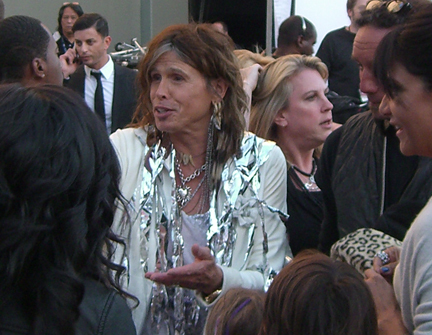 Steven Tyler, Jennifer Lopez, and Randy Jackson headed to their trailers stopping to chat with friends and VIP guests and willingly posing for pictures and signing autographs. An excited young man who had just gotten Jennifer Lopez's autograph pulled out his cell phone and called his mother. "Mom," he said, "dreams do come true!" 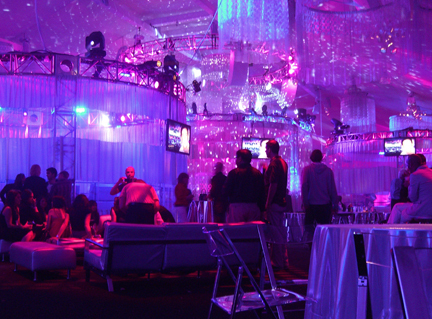 The afterparty was held in a huge tent that had been erected on a rooftop. A red carpet led us past big FOX letters, an outdoor eating area to the right, and a promotional area to the left where partygoers could play a videogame to win American Idol t-shirts, portable speakers, and autographed American Idol books, or pose for pictures with life-sized, life-like Scotty and Lauren cardboard cutouts. Inside the tent, sheer fabric formed circular VIP rooms and decorated the ceiling. Lighting effects completed the scene. Music filled the air. White couches were available for lounging. Initially, the couches were decorated with silver and sequined, American Idol and Ford pillows, but partygoers quickly claimed them as their own. On either side of the tent were two buffet tables offering steak, parmesan crusted chicken, veggies, and biscuits, and an open bar. I grabbed a quick bite to eat, as the show had run right through our west coast dinner time. While I ate, one of the buffet tables on each side of the tent transformed into a magnificent dessert table with tiny ice cream cones holding creamy filling, decadent squares of chocolate cake, chocolate dipped marshmallows and pretzels, fresh berry and pudding cups, and "cake pops" (small balls of rich cake dipped in white or milk chocolate and rolled in sprinkles, on a lollypop stick). My sweet tooth was thoroughly satisfied. At the far end of the tent were two photo booths, similar to the ones at amusement parks and arcades. I jumped inside and posed. Seconds later, the machine spit out a strip of photos of me with the words, "American Idol Season 10 Finale Post Party," at the bottom of the strip. It was the ultimate souvenir. Finally, the guests of honor began to arrive on the afterparty red carpet. I saw Lauren Alaina, Casey Abrams, Jacob Lusk, Hailey Reinhart, and Paul McDonald who were quickly surrounded by the afterparty guests. The Idols happily posed for pictures and signed autographs before heading inside. Back inside the tent, that night's American Idol show, the one we'd seen live just hours before, aired on the screens above the VIP "rooms." It was interesting to see the show from the television audience's perspective. When the time came to announce the winner, the audio was broadcast throughout the tent. Even the second time around, it was a powerful moment! I did this on May 25th, 2011 in Los Angeles, California, USA. *Jen attended a taping of American Idol as a guest of production.